A home where every person BELONGS to God, and so to one another. A transforming community of faith where each DISCOVERS and RESPONDS to God’s call. Welcome to Portage Chapel Hill United Methodist Church, a church in the service of Christ, where all peoples are welcome and invited to grow in Christian discipleship by discovering, through Christ, meaning and purpose in their daily living, working and loving by: discerning their own unique gifts, talents and strengths cultivating these gifts and preparing to accept new ministries deploying their gifts as ambassadors for Christ in the ministry of reconciliation in their home, school, community and workplace. We are called to recognize Christ in everyone, inclusive of, but not limited to those of differing socioeconomic status, sexual orientation, race, age, ethnic background, creed, gender, disabilities or abilities and family make up. We understand diversity to be a gift from a creative God. We discern that God is challenging the Christian community to lead by example and to strive to reflect God’s unconditional and forgiving love, and to be a life-giving church community that reaches out to all. 1. We are committed to Faith – building deeper, fuller, more purposeful lives in Christ through worship, study, prayer and service. 2. 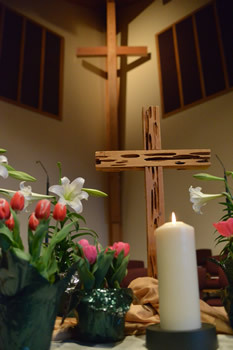 We are committed to Participation – celebrating the love of Christ and the joy of Christian community through a variety of worship experiences and programs, offering a variety of opportunities to fit congregational needs. 3. We are committed to Mutual Nurture and Support –being a friendly, caring and supportive church community. 4. We are committed to Family – being family-oriented, knowing that families come in many forms; we cherish children and strive to help them grow in faith in a safe environment. 5. We are committed to Diversity – becoming more diverse, as supported by our Welcoming Statement. 6. We are committed to Outreach –helping our neighbors through local programs and actions, bettering lives world-wide working through the larger United Methodist Church, and bringing others to know Christ. 7. We are committed to Social action – educating and acting faithfully on social issues. 8. We are committed to Stewardship – making wise use of God’s gifts of resources and time. These goals have been nurtured and reviewed in Church Council and by the Core Teams of Portage Chapel Hill United Methodist Church. The Vision Team, the group that continually monitors the vision and our progress in moving to that horizon line to which God calls us, was asked to steward a major revision of the plan based on feedback from Council and work of the individual Core Teams and Support Teams of the church. Foster engagement of PCHUM disciples in order to reflect our core commitments. Create an Environment of supportive interpersonal relationships. Intentionally building meaningful relationships with the body. Demonstrate non-intimidating welcome for people who come through the door. Create a culture of engagement. Mobilize PCHUM disciples to carry our core commitments to foster social change in the community. Fully, and faithfully, utilize and broaden PCHUM resources to support the congregational vision. Utilize members not only for professional or demonstrated competencies, but for what they love/want to do (passions). Provide opportunities for expanded stewardship in terms of time, talents, and financial resources. Identify needed areas of spiritual growth and provide opportunities for meeting these needs. Provide on-going and creative opportunities for leadership development. Nurture and support volunteer ministry opportunities at all levels of church life and support ministry passions with appropriate development and training. Explore emerging and creative ways to engage persons in leadership development. Invite volunteer opportunities and engagement through personal contact. Encourage others to seek engagement in volunteer opportunities. Be responsive to community needs. Establish communication with community congregations and organizations to identify and coordinate response to community needs. Utilize internal and external memories and wisdom. Assure that ministries support the unique needs of ALL PCHUM participants. Nurture all persons in a healthy and safe environment in which all persons can learn, grow and serve. Be a place of open, honest, and playful discourse such that we seek, not to be one in opinion, but one in spirit. Protect each other and admonish those who would be exclusive or divisive. Create mechanisms to identify and respond to the needs of all in learning, growing and serving. The mission of the United Methodist Church universal is to make disciples of Jesus Christ for the transformation of the world.